Canada's Anglo-Celtic Connections: How many grandchildren? It's not too difficult to find statistics on a woman's family size. The average number of children varies between cultures and has been decreasing with development. Table 1 in the article Family size as a social leveller for children in the second demographic transition shows that for women born around 1960 the median family size in Ireland was 2.26 and 1.98 in both England & Wales and the USA. The chart shows the percent of women having zero to four+ children in those jurisdictions. With a few assumptions the number of grandchildren can be estimated. As the median number of children is about two, if we assumed that applied exactly at all generations the number of grandchildren would be four. While the median may be two what is the impact of the distribution? Assuming there are no more than four children the extremes are zero, a woman who has no children can have no grandchildren, and 16 — four children having four children each. 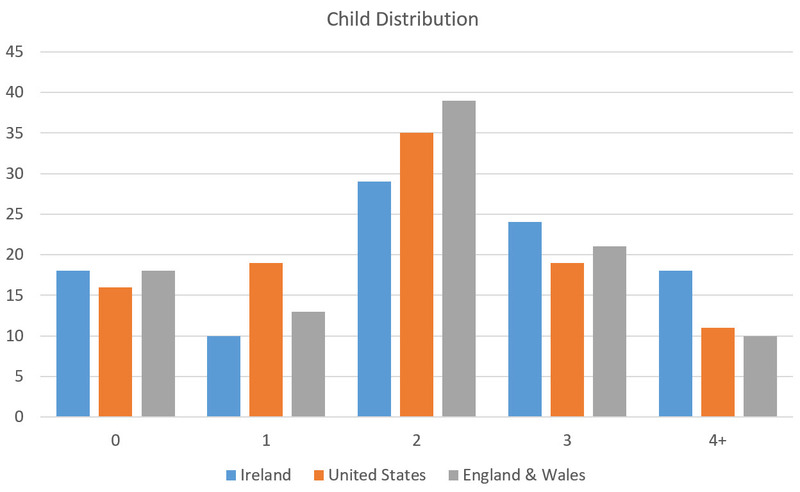 The distribution of grandchildren for the Ireland, USA and England & Wales child distributions was calculated using a Monte Carlo simulation computed for over one million grandchild trials. 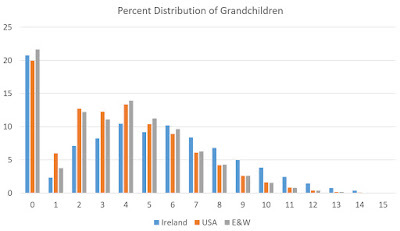 As expected, with the exception of the women who have none, the peak of the distribution is four grandchildren although the distribution for Ireland has almost as many for six. 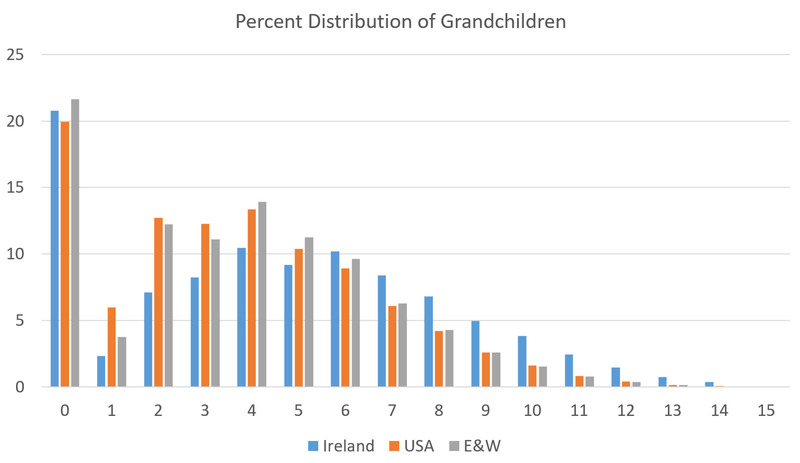 Three and four plus child families in Ireland results in more grandchildren — ten grandchild families are twice as frequent in Ireland as in England & Wales or the USA. The dips found at three and five grandchildren recur when the simulation is repeated. It's unfortunate the published statistics do not break out the four+ category so the influence of infrequent large numbers of children in a family can be more clearly identified.